What Happens To You After You Spend A Year In Space? There’s a cornucopia of research that life in space changes your body. Astronauts in microgravity face bone loss and muscle atrophy, depressed immune systems, and sleep problems. Some astronauts have vision changes. But can those changes be seen on a genetic level, especially after a longer time in orbit? How do you truly isolate spaceflight as the cause of what’s happening? And what happens after the same astronaut returns to Earth? To find out what was happening over longer periods of space flight, NASA put together a 10-team study of twin astronauts Scott and Mark Kelly. Scott spent a year on International Space Station, while his brother Mark lived a relatively normal life on Earth—though both regularly sent the researchers samples of their blood, urine, cognitive test results, and other data to assess their physiology over time. Scott Kelly returned to Earth in 2016, and researchers have been studying and comparing the twins ever since. The conclusion? A year in space caused a cascade of changes in Scott’s gene expression and physiology—some of which remained even after he returned to Earth. And while many were lower risk changes, there were noteworthy lingering effects that might show up more prominently in astronauts on future long missions past Earth’s magnetosphere, like the Moon or Mars. Dr. Susan Bailey, a radiation biologist at Colorado State University, explains one surprising mystery: The average length of Scott’s telomeres, a part of DNA that usually shortens with aging or other kinds of stress, increased. 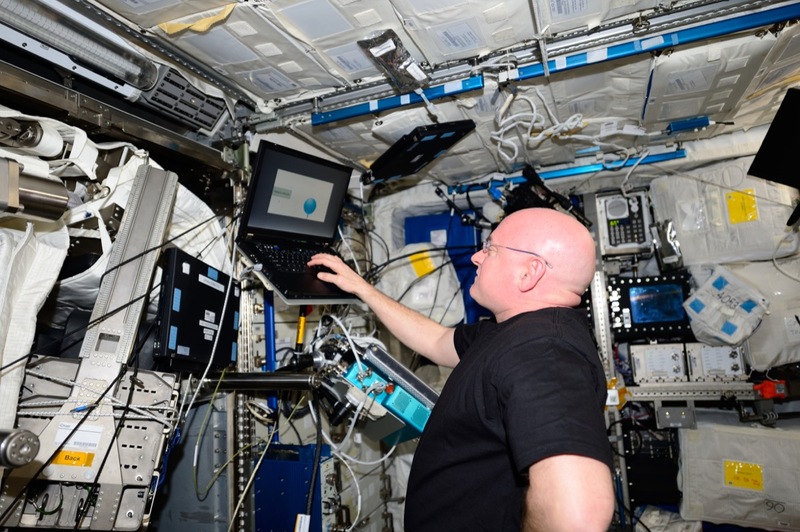 And Dr. Christopher Mason at Weill Cornell Medicine explains how spaceflight ramped up genes associated with Scott Kelly’s immune system and what remained different even months after his return to Earth. Listen to a Science Friday interview with the Kelly twins during the time the study took place. Read the paper with the results from the year-long study in Science. Learn more about the context of the study from WIRED. Christopher Mason is an associate professor of Physiology and Biophysics at Weill Cornell Medicine in New York, New York. Susan Bailey is a professor of Radiation Cancer Biology and Oncology at Colorado State University in Fort Collins, Colorado. IRA FLATOW: This is Science Friday. I’m Ira Flatow. A bit later in the hour, we’ll talk about the cherry blossom hunter, English ornithologist, and naturalist Collingwood Ingram, who gave up studying birds to devote his life to cataloging and preserving rare flowering cherry varieties. Subject of the new book, The Sakura Obsession. But first, how many of you are twins? That many? Well, are you tired of being compared to your sibling? Maybe your parents dressed you alike or people keep asking you who was born first, right? But twins have been a boon to science. So many twins studies, examining the differences in their life stories, their ills, their diseases, the ultimate comparison. And now two famous twins, astronauts, have lent their lives to science. Specifically, what happens to your body after extended periods in the weightless, higher radiation levels of space? We’ve been asking this question since the beginning of human spaceflight, and there’s still a lot we don’t know. Astronauts have to exercise frequently to fight bone mineralization and muscle atrophy, fluids shift in their bodies in microgravity, and some even have vision changes. But in 2015, NASA undertook a more ambitious project to study the physiological and genetic changes of an identical twin pair, and those twins were astronauts Mark and Scott Kelly. Mark stayed on Earth, Scott spent nearly a full year on the International Space Station. In that time, they sent research teams samples of their blood, their urine; they took cognitive tests and put as much of their physiology under the microscope as possible to suss out what was going on in the space-born Scott cells that didn’t happen to his brother. SCOTT KELLY: There’s stuff that you don’t see that the researchers, at some point, will publish papers on. You know, for instance, how my DNA looked one way before flight, and how his compared before flight, and then maybe how mine changed over time while I was here, where his, you know, in a certain area, stayed the same. IRA FLATOW: That’s Scott Kelly talking to us in 2015, early in the experiment. And now the data is in, published this week in the journal Science. And we’re going to talk about the results, some of them surprising, with the leaders of two of the research teams on the NASA Twins Study. Dr. Susan Bailey, professor of radiation cancer biology and oncology at Colorado State University. Welcome, Dr. Bailey. SUSAN BAILEY: Thank you. Thank you so much. IRA FLATOW: You’re welcome. And Dr. Christopher Mason, associate professor of physiology and biophysics at the Weill Cornell Medical Center here in New York. Welcome. CHRISTOPHER MASON: Thanks for having me. IRA FLATOW: Let me ask you, Christopher– the study wrapped up, the data is in. It’s a 90 page paper. IRA FLATOW: Can you sum it up at all? What happened to Scott but didn’t happen to Mark first? CHRISTOPHER MASON: Yeah. So it’s a bit of a tome. There’s a lot to read. But it is because we wanted to look at every molecule that we possibly could. Really every sort of physiological, molecular, genetic, really cognitive, even vasculature change, we wanted to map it all as best as we could. And we found that there’s mostly good news because lots of things change. Really, thousands of genes change. There’s many alterations to your DNA, to your proteins, to your whole body, but most of it goes back to normal once you get back to Earth. And some of the things that did change include alterations to some of those telomeres, which Dr. Bailey will tell you about. And then also we saw gene expression– what goes on and off in terms of how your DNA is basically transcribed and becomes active or deactivated. Some of those genes also changed and persisted. IRA FLATOW: So the early reports that said that 7% of the DNA change, that’s not true. CHRISTOPHER MASON: Right. If 7% of his DNA changed, he’d be definitely a different species. So he did not come back heavily mutated, at least to be a different species. But there were some things that changed fundamentally to basic how his DNA is packaged and, really, mapped out, and Dr. Bailey studied that in the telomeres. IRA FLATOW: Tell us what you found, Dr. Bailey. SUSAN BAILEY: Yes. Well, we were really interested in looking at telomeres, or the ends of the chromosomes, and what they might tell us about aging and how that might be influenced by spaceflight. So we went into the study imagining that, in fact, all of the different stresses and exposures of spaceflight would really act to accelerate telomere loss. And so Scott’s telomeres would be shorter than– Scott’s telomeres would be shorter than Mark’s after the year in space. But, in fact, what we found was pretty much the opposite. During flight, Scott had many more long telomeres than he did beforehand. And then when he came back to Earth, within 48 hours, the closest samples that we had, his telomere length shortened dramatically. And so very rapid shift in telomere length. And then over the following months after he got back, his average telomere length did stabilize, but he still had many more short telomeres than he did when he started. So some really dramatic shifts in the telomere length that we really don’t quite understand, but it’s fascinating. IRA FLATOW: Did do the longer telomeres mean Scott Kelly was healthier in space? SUSAN BAILEY: No, and I don’t think it really is the fountain of youth either. What exactly it is, I’m not real sure. I mean, they do live pretty healthy lifestyles. Their diets are very defined, they exercise a lot, they lose body mass, so caloric restriction. Scott lost about 15 pounds while he was up there. So things that we associate with healthy lifestyles here on earth that influence telomere length. But even those things don’t really make your telomeres longer, they just help you maintain telomere length. So we’re still really scratching our heads on this one and imagining that it could be something like radiation exposure, for example, or chronic exposure could be triggering some kind of a response that changes the cell populations themselves. And perhaps it’s something like that. IRA FLATOW: Our number 844-724-8255 if our listeners would like to get involved, and I’m sure they would. You can also tweet us @scifri. Christopher, there are things we know happen to astronauts– bone loss, I said muscle atrophy, vision changes for some. Did any of this seem to show up in Scott’s gene expression? CHRISTOPHER MASON: Yeah, very much so. So we saw a lot of the things you would expect right out of the gates. So you can see bone loss. Essentially, all the genes that are activated for osteoblasts or things that are actually helping to maintain and create bone density were really ramped up. And then also in his urine, you could see the calcium sort of disappearing. So you could see a struggle in his body to both build bones and muscle, and then also as it was failing, in the sense it was being degraded at the same. Time. IRA FLATOW: So was it confused? The body was confused? CHRISTOPHER MASON: It’s a struggle. It’s a Sisyphean struggle. You’re pushing a rock up the mountain. You’re just trying to make it so you don’t fall down the mountain, really. You have to keep building the bone density as it’s being sort of degraded by the lack of use. And so we could see that– like, looking in his blood– we took blood samples, dozens of points over– it was hundreds of samples at the end of the study. And we’d separate out the fractions of cells. So we’d look in the plasma of the blood, look in different kinds of immune cells, look at as much as we could from within the body. And it really serves as this molecular echo and a sort of a scan of what happens in the body. And very much so, bone density, we saw, really, the building up of muscle and some of the atrophy at the same time. But really what was striking is also the immune system was ramped up. Some of the most significant changes were all in T cell biology. You think of your immune cells that help scavenge through the bloodstream and also DNA damage, DNA repair. All these genes were really ramped up. And more, especially in the last six months of the mission, than the first half. IRA FLATOW: So there was a sort of a switch after six months that got turned on? CHRISTOPHER MASON: Yeah. It seems as if it was– it wasn’t like he just got up there and adapted and was OK.
CHRISTOPHER MASON: I mean, by some measures, he was, but in terms of how many genes are activated and really sort of responding to spaceflight, it’s a continual adaptation. IRA FLATOW: And so astronauts who are not up there for six months or longer, they don’t have the same sort of reaction. CHRISTOPHER MASON: No. I mean, some of the pathways we’ve seen and some of the genes that were activated have been observed in previous missions, but nothing to this degree and nothing at this scale. IRA FLATOW: Mhm. Susan, you also looked at damage to the chromosomes themselves. It makes sense, right, with the higher radiation on the space station? SUSAN BAILEY: Oh, yes. Yes. It sure does. SUSAN BAILEY: Yeah. And it also fit very nicely with the work that Dr. Mason was just talking about with the DNA damage response. They saw evidence of that in the gene expression. But we also saw it visually when we looked at chromosomes and how they rearranged. We know that those things are caused by radiation exposure. So we saw translocations, rearrangements between chromosomes, as well as inversions, rearrangements within a chromosome itself. And all of that was very, very consistent with space radiation exposure during flight in Scott. IRA FLATOW: So when Scott got back to Earth, did any of the damage get repaired? Did any of the DNA movement move back? SUSAN BAILEY: Well, it doesn’t really move back. But you do see, for example, elevated frequencies of chromosome aberrations in flight of both translocations and inversions. When he came back, the translocation frequency went down. And, again, that’s usually because he loses those cells with translocations. They don’t really survive. So those cells drop out of the population. However, the story on inversions was a little different. They did persist, and were still elevated after flight. So, again, just evidence of an ongoing kind of instability that continued even after he got back. IRA FLATOW: One quick question from the phones from Joe in Gainesville, Florida before we go to the break. Hi, Joe. JOE: Yes. I’m curious, the samples they took from Scott– urine, blood, et cetera– they were kept up there until they could be returned to Earth on a supply mission. Did the stay on the station change the samples once they were taken from Scott’s body? CHRISTOPHER MASON: Good question. I’ll jump in quick first. We did take two kinds of samples– some that were frozen using a centrifuge on the space station that matched the speed and the angle on Earth. So we had some frozen samples, and they were kept frozen all the whole way down. What we also did was called an ambient return collection. So Scott would draw blood and basically pop it into the Soyuz capsule, it would be dropped back into Kazakhstan, would be picked up, repatriated, brought back to Houston– that’s a verb I’ve never used on this study is repatriated a sample– and then sorted cells. And we needed live cells for some of the work that Dr. Bailey wanted to do, and also a way to sort purified cells. So we did as best as we could to make sure we could get rid of any batch effects, and we have two kinds of collection. IRA FLATOW: Susan, any question before we have to go to the break? SUSAN BAILEY: No. No, I’d just add to that that, yes, our samples also came back to us ambient on the Soyuz and then jetted back to Johnson Space Center, and we did our processing and analysis at Johnson Space Center. CHRISTOPHER MASON: All within 38 hours they’d come back to Earth. SUSAN BAILEY: Yeah. It’s amazing. IRA FLATOW: Quickest repatriation ever. SUSAN BAILEY: Yes, that’s right. Now you know why the paper was so long. IRA FLATOW: We will take a break and talk lots more with Susan Bailey of Colorado State University and Christopher Mason of Weill Cornell Medicine right here in New York. Our number 844-724-8255. Stay with us. We’ll be right back after this break. This is Science Friday. I’m Ira Flatow. We’re talking this hour about what life in space, microgravity radiation, confined spaces, and more does to your cells, and even the DNA in your cells. The ultimate twins study, astronauts Scott and Mark Kelly. That study was published this week in Science. My guests are Dr. Susan Bailey of Colorado State University in Fort Collins, Dr. Christopher Mason of Weill Cornell Medical Center here in New York City. Our number 844-724-8255. Getting back to the bottom line on all of this, let me repeat for listeners who are joining us now. Christopher, did Astronaut Kelly have any long lasting– Scott, did he have any long lasting effects from this, that we know yet? CHRISTOPHER MASON: So most of it reverted back to normal, as we had described a little bit before, but there were some things that did persist. And so we’d looked at a lot of genes that changed. They adapt to environments as they do here on Earth. And in space, we saw thousands and thousands of genes change. And almost all of them went back to normal, but about 800 of them were still– looked as if he was still in space, even six months later. And earlier this week, we were chatting with Scott a bit more and he said, you know, he really felt like he was a little bit off, even on until eight or nine months after he got back to Earth. So I think there was a continual adaptation that took at least six months for him to revert back to normal, at least in terms of the gene expression data. But other things change really rapidly. So if you look, for example, in his blood, we saw some measures increased 4,000% as soon as he landed that are with inflammation markers, but almost all of those went back away within a couple of days. And same with telomeres, as we’ve heard from Dr. Bailey. IRA FLATOW: Susan, Dr. Bailey, what do we need to know more about before we allow people to go to Mars, where they’re going to be in space a lot longer than a year, right? SUSAN BAILEY: Yes. Yes. Well, I certainly would like to know a lot more about why these changes and shifts in telomere length dynamics are occurring. I think if we understood why they were happening, we could know what to do about it, or if there’s any real concern there, as astronauts spend longer and longer periods of time in space. I do think that it alerts us to the fact as well when they come back that they do have a lot more short telomeres, which can put them at increased risk of aging and some of the diseases that go along with aging like cardiovascular disease and some cancers. IRA FLATOW: Tell us why the telomeres are so interesting to you. What do they do? IRA FLATOW: What are they? SUSAN BAILEY: They are the ends of our chromosomes, and that really– kind of like the end of a shoe string, perhaps, that you could think of. That it protects the end from fraying, from damage. And they shorten as we get older because they shorten with cell division. But they also shorten with all kinds of stress and exposures to things like radiation. Or at least that’s what we think on Earth. That’s what we see. So they can be a very informative biomarker of how quickly or how well a person is aging, as well as if they’re– a lot of short telomeres can also be very indicative or associated with some of the diseases that we associate with aging like cardiovascular disease. IRA FLATOW: Which do you think– and I’ll ask both of you. Let me let me begin with you, Chris. Which is the greater hazard, radiation or microgravity and weightlessness? CHRISTOPHER MASON: Well, I think we can see evidence of both, definitely, in terms of what we know for human biology or what we’ve looked at in mouse samples that have been sent as an analog into the space station. And from what we can tell, at least from the gene expression data, like, how much of your genome, of all the genes in your cells, are adapting? We see a lot more response to radiation, but, frankly, we know those networks of biology much better than we know, like, what is the microgravity or reduced gravity response to cells? We do see both, but I think the one that’s still active and seems to be the most active from what we can tell is, really, the radiation because it propagates to all parts of cells. One of the things that happened after the mission is cognitive sort of metrics were worse off six months later. IRA FLATOW: That didn’t get better, did it? CHRISTOPHER MASON: No. And so that’s another thing that’s on the list of things that are not necessarily bad, but they’re just not the direction that you’d want them to be. IRA FLATOW: But they were permanent as far as they could test six months out. CHRISTOPHER MASON: Six months out. Right. CHRISTOPHER MASON: By speed and accuracy, work from Mathias Basner’s group that really showed that he really– and for these 10 different cognitive tests– solving puzzles, shape recognitions, quick math– he was not as good as he was when he was even in space. IRA FLATOW: Susan, what’s that going to mean for somebody who gets to Mars and has lost his cognitive– or at least some of his abilities? SUSAN BAILEY: Well, that’s not going to be very good, now, is it? So, yeah, I mean, it is definitely a concern and something that we really need to figure out. But I would certainly agree that I think radiation exposure is, by far, the greatest risk. And cognitive decline has been associated with radiation exposure, particularly to space radiation. So I think, again, radiation is really going to be the thing that we need to learn how to deal with. And I think technology is going to have to be the thing that helps us there. You know, either get them there quicker or figure out some better shielding that they can take with them. But I think most of the health effects or the damaging things that we saw could be explained by radiation exposure. CHRISTOPHER MASON: Yeah. I mean, his legs swelled up. He really felt like– they turned into balloons, he said. He felt like he needed to go to the emergency room. Even just the simple weight of clothing on his arm, since he hadn’t felt it in a year, his arms broke out into a rash. And we can actually see that in the blood. The inflammation markers were sky high. Like I said, sometimes several thousand percent higher than what they were before the mission or even during the mission. So, you know, it’s interesting. Some things change as soon as you get to space. You can see cortisol levels will spike up because your body’s thinking, well, I’m in space. So it’s surprising. But then they’ll sort of settle down. And Scott, in general, is as cool as a cucumber, but the body didn’t react well to gravity. IRA FLATOW: Do we know– I mean, the Soviets have had their own cosmonauts in space. I mean, have they shared data with us? CHRISTOPHER MASON: There was another Russian cosmonaut that was up for a year, but not all of the data has been shared, or not that much of it, actually, that we’ve seen and that I know exists. So that’s still being negotiated. IRA FLATOW: I see [INAUDIBLE] still talking to them. CHRISTOPHER MASON: Yes. Yeah. You know, I tried to call Putin last night, but he didn’t pick up my call. IRA FLATOW: So where do we go from here? I mean, Doctor, what would you recommend that we do? Let me as Susan first, and then, Christopher, you can answer. SUSAN BAILEY: Well, I think there’s certainly– the twin study represents, by far, the most comprehensive study that’s ever been done on the response of the human body to spaceflight. And as such, it’s really a landmark and it sets the baseline for going forward. You know, we now know a lot more about the questions to ask. We know more about the health effects to monitor when our astronauts come back. So I think in that sense, it’s been a huge step forward and really does set the bar and will help us as we go into future studies and get additional astronauts. IRA FLATOW: Yeah. Because we only have n equals 1 now, right? CHRISTOPHER MASON: It’s N of 1, but over hundreds of time points. So we know a lot about how things changed over time. But for sure, the most important goal is to do things with greater numbers of samples. There’s only 569 people that have ever left Earth and gone to 100 kilometers. So the sample size can’t get that big yet. But I think every cosmonaut, astronaut, every commercial spaceflight that goes up, we now know what to look for. And I think it really is helpful for humanity to think more about what happens to other people at different ages and genders. IRA FLATOW: Well, we know the president has talked about going back to the moon. IRA FLATOW: Forget about Mars for now. I mean, the moon has even less gravity than Mars does. IRA FLATOW: Any radiation exposure there? CHRISTOPHER MASON: It is higher. SUSAN BAILEY: Oh, yes. Much higher. Because they’re outside of the protection of the Earth. IRA FLATOW: The Van Allen belt. SUSAN BAILEY: The Van Allen belt’s atmosphere– all those things that protect us here, you know, they don’t have on the moon, or certainly not at Mars. IRA FLATOW: So you’d want to solve that problem before five years is up. IRA FLATOW: And with that happy news, let me wind up and say thank you very much, Dr. Susan Bailey, professor of radiation cancer biology and oncology, Colorado State University in Fort Collins; and Christopher Mason, associate professor of physiology and biophysics at Weill Cornell Medical Center here in New York. IRA FLATOW: Thank you both for taking the time to be with us today. SUSAN BAILEY: Thank you so much. Astronaut Scott Kelly—aboard the International Space Station—and his Earth-bound twin brother, Mark, talk about the effects of living in space for one year.